How Can I Defend Against Tax Fraud During a Divorce? During a marriage, both spouses trust each other with secrets and personal information over the course of many years. However, when those two people split apart as the result of a divorce, each person becomes vulnerable to the other as a result of the private information they shared while married. If either spouse has entrusted the other with information about criminal or questionable behavior in the past, such information may become a challenge for the present. One classic example that often surfaces in contested and acrimonious divorce proceedings is fraud and tax evasion. Tax fraud generally refers to intentional violations of the United States Internal Revenue Code (Title 26 of the United States Code) and specific violations are outlined at 26 U.S.C. § 7201 et seq. Conspiracy to commit tax fraud is also considered an attempt to defraud the United States government and is punishable under the federal criminal code at 18 U.S.C. § 371. Allegations of tax fraud are investigated by the Internal Revenue Service (IRS) in conjunction with the local United States Attorney’s Office. The most common tax crime is tax evasion, wherein an individual or business deliberately misrepresents taxable income on tax returns in an effort to avoid or underpay taxes. Examples of tax evasion include under-declaring income on tax returns, overstating deductions on tax returns, or failing to file tax returns. While everyone tries to minimize tax exposure and to pay as little taxes as possible, the line to criminal behavior is crossed if, with the intent to evade or defeat taxes liability, reportable income was either not reported or if it was reported but associated taxes were not paid. Under United States law, tax fraud and tax evasion constitute federal felonies. Tax crimes may be prosecuted criminally, civilly, or both, at the discretion of the federal prosecutor. A civil conviction for tax fraud is punishable by fines of up to $250,000 for individuals and up to $500,000 for corporations. Criminal convictions for tax crimes are punishable by up to 5 years in federal prison. Those found guilty of tax crimes may also be required to reimburse the government for its costs prosecuting the case against them. 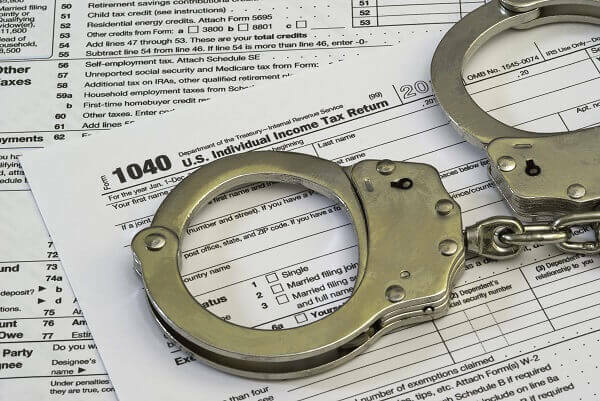 Tax crimes can often be difficult to prosecute because the government’s attorneys have the burden of proving that the defendant intended to defraud the government, as opposed to merely showing that the defendant made mistakes in reports to the IRS. However, in divorce proceedings, the longtime friend, partner and spouse of a defendant may have critical information that can be shared with federal law enforcement agencies to demonstrate that that individual willfully and intentionally defrauded the IRS. At Oberheiden, P.C., we have seen how one spouse’s knowledge of the other spouse’s past mistakes can significantly impact divorce outcomes, custody arrangements, and the other spouses’ livelihoods. In our practice helping professionals and individual clients fighting crime allegations in divorce proceedings, we understand the importance of not underestimating a claim of criminal conduct or threat of criminal allegations. Regardless as to whether or not your taxes were filed jointly or separately, the attorneys of Oberheiden, P.C. do not take tax fraud accusations lightly and nor should you. Not only do we frequently represent clients accused of federal offences such as tax fraud and tax evasion, our attorneys have also prosecuted these offenses in our previous careers as prosecutors with the Department of Justice. Based on our experience, we recommend that you contact federal criminal defense attorneys the moment an allegation is made, even if you do not feel that the allegation is serious. If you have faced an allegation or the threat of a tax fraud allegation, you should not hesitate to call Oberheiden, P.C. for a free and confidential consultation. Our attorneys are standing by to speak with you about your case seven days a week and you will not be walled off by secretaries or junior attorneys.